Huw Phillips (centre) with Graham Pratt (left) and Mickey Tighe. A good field of thirty-five golfers set out in nice, cooler conditions to a golf course that Links Golf has not been to in a long time. There were varying degrees of opinion about the condition of the course here. No, it’s not pristine like many others, but fairways were cut nicely, the bunkers are a trap, excuse the pun, and the rough is very high and lots of it. The greens were once known as very good and having some pace, but today were described variously as grainy, “Velcro” and inconsistent. What happened? The “A” flight saw Alan Thomas prove that he is a six handicap, scoring 38 points to take first place. He was followed closely by two players on 37 where Simon Kendall won the countback over Maurice Roberts. Kevin LaBar was back in the winner’s list taking fourth place with 36 points. 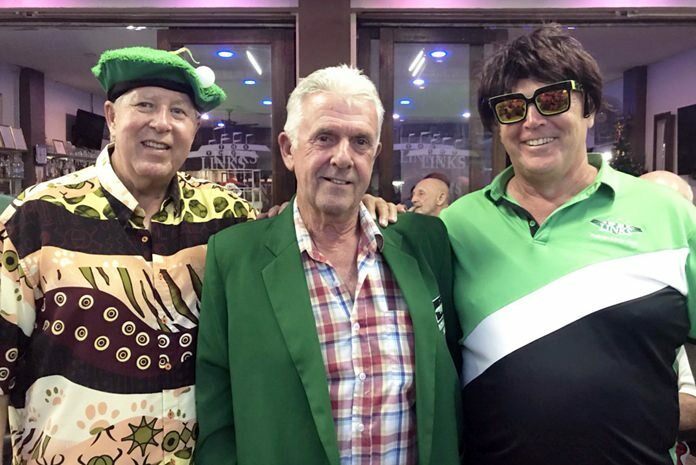 The “B” flight (16+) gave Huw Phillips his second Green Jacket in a fortnight, but he had to withstand a countback, as Patrick Poussier also scored 39 points, that’s good going. Jim Ferris has had a great run of late and continued that form, scoring an even 36 points to win yet another countback, this time relegating Niall Caven to fourth. Mashi Kaneta (20pts) and Frank Riley (20pts) recorded the best half games while near pins went Tony Browne, Patrick Poussier, Graham Pratt and Simon Kendall. The society visited Greenwood on Wednesday to play a stableford competition in three flights, cut at fifteen and nineteen, leaving those on twenty and above in the third flight. A quality field of 44 golfers set off on time from the B and C tees and progress was good. Alan Spencer (centre) with Tip Briney (left) and Kevin LaBar. Scores in the second flight (16-19) disappointed with Willy Brown managing fourth place with 32 points on his return round, a couple behind Colin Service, again on form, with 34. The top two were separated by countback with Paul Chesney’s better C nine score taking the win ahead of Derek Phillips, both with 35 points. The third flight saw an eclectic mix of scores as Murray Edwards plodded to fourth place with 27 points, one behind third placed man Alan Spencer on 28. In second was Frank Riley with 34 points, but the man of the moment was Aussie Bryan Barrell whose 39 points represented his best score in more than six years golf with the group. Bryan is a very patient golfer! The top flight was treated to some fine golf as American-Thai golfer Zack Tsisri posted 35 points on his debut round with PLGS for fourth place. 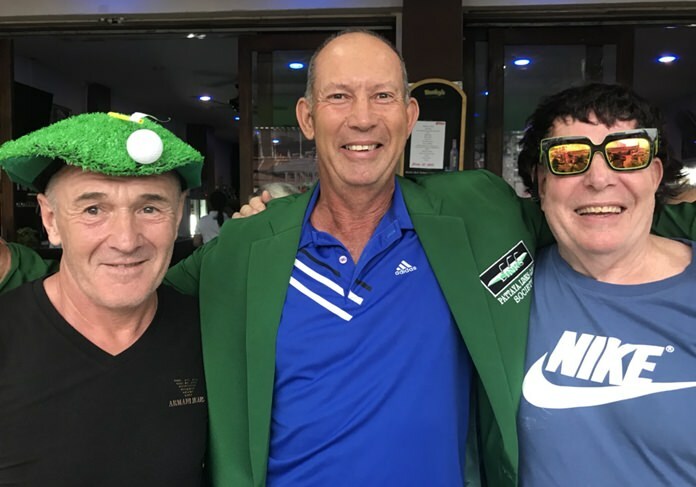 Third spot went to Simon Kendall who played another fine round with 36 points and the runner-up was Alan Humphries with 39 points, his best this trip. This left Huw Phillips to “lord it” for the second time this week with a sublime 41 points. The usual technicals were contested, in two flights with near pins going to Derek Phillips, Alan Spencer, Jim Ferris, Kevin LaBar, George Muller, Huw Phillips and Dave Ritchie and the longest putt, a rarity at Links, on hole B9 went to Paul Chesney. Consolation awards went to Carl Luke for the best B nine score of 19 points and Colm Lawlor with the best C nine score of 20 points. 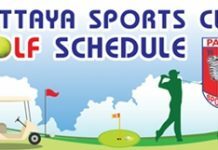 The group went local on Friday when they visited Pattaya Country Club to play a stableford competition from the white tees in two divisions, cut at eighteen and under. The course was in good condition and well grassed fairways ended in quick greens. Sadly, a little early Christmas spirit may have affected the greenkeeper, as pins were placed on or near the top of the slopes thus making putting a problem. Forty golfers made good progress in very comfortable breezy conditions and the scores in both flights reflected the problems that were present. In the second flight fourth place went to Bryan Barrell with 32 points and his near-pin on seventeen gave him his most successful week with PLGS. In third was Graham Pratt with 33 points. Wot? No wig? Certainly not this time and he is to be congratulated for putting up with all the friendly banter and showing he can come good. Frank Riley occupied second place with 35 points and the flight winner was Alan Spencer with an even par 36. The best front-nine award went to Nigel Harrison with 22 points and the best back-nine to Niels Peter Kristensen with 21.